People do things. People do things for no particular reason. They do it because it’s fun. They do it because it’s different. People do things for the sake of doing them. 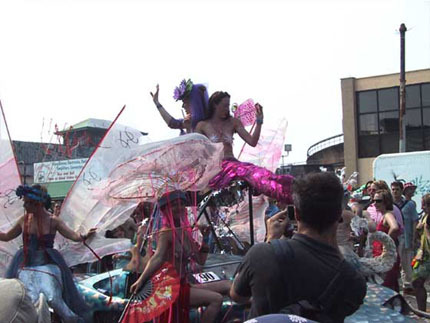 The Mermaid Parade is exactly that. 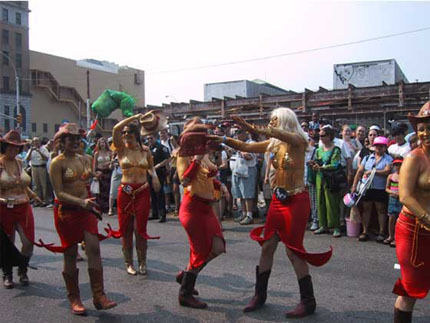 For the 19th time, the annual Mermaid Parade was held on one hot sunny day in June in a place called Coney Island of Brooklyn, New York. Hundreds of people dress like mermaids, or whatever they wish, and parade down Surf Avenue of Coney Island. Groups of young and old cruise down the avenue dancing, singing, and pleasing the crowd. People, especially those who participate in the parade, genuinely have fun, escaping from their usual daily grinds of work. Coney Island is at the southern end of New York Boroughs facing the Atlantic Ocean. It has streets with names like “Neptune,” “Mermaid,” and “Surf.” It was, like New York City, a place known throughout the world. It was once world-famous for its horse racing, boxing rings, and amusement parks. However, after World War II, much of Coney Island was bulldozed to build high-rise apartment buildings that drew low-income families. This eventually repelled tourists, leading to its reputation as slumhood. Still, Coney Island has very unique qualities. It has one of America’s oldest roller coasters called “Cyclone.” The Mermaid Parade is definitely one of its uniquenesses. It is an event of the local people and for the local people. It is quintessentially New York.